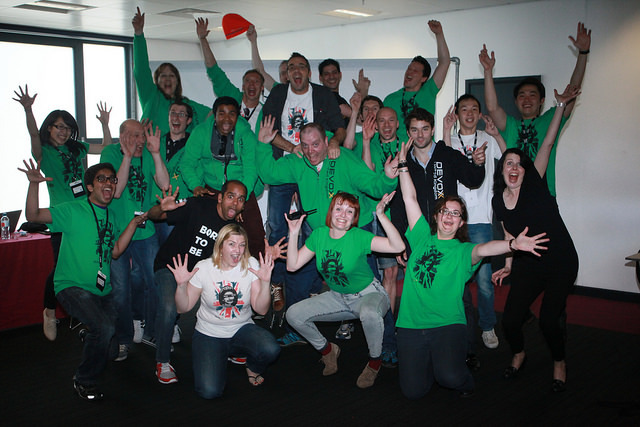 Devoxx UK 2014 Conference Review! I was fortunate enough this year to be invited to sit on the program committee and review submissions (thanks Mark et al!). I’ll create a separate post about this experience later, but I wanted to start this review by mentioning that the number of submissions for Devoxx UK was very high, and the quality was outstanding. According to my fellow Program Committee members, the job of picking which talks to include in the conference gets more difficult each year! As many committee members mentioned, we could have easily picked talks to fill an entire week of conference, but the difficult thing was that Devoxx UK was only running for 2 days! The conference began in style with a live beatbox session from the UK Champion ‘Reeps One‘. Check out some of his stuff on youtube, but this guy needs to be seen live to get the full experience! The final conference session of the day that I attended was John Smart’s “It’s testing Jim, but not as we know it”. This session was a personal highlight of the conference for me, and the discussion of BDD really hit home to the projects I have recently been working on. John also has a MEAP book ‘BDD In Action’ which I can highly recommend. After our talk both Steve and I stayed in the same room to listen to the panel session “What does the Oracle/Google shenanigans mean to the Java Developer”. This talk was not only very funny (almost guaranteed when you create a panel containing Ted Neward with a lawyer…), but also quite pertinent, what with all of the interesting IP/patent issues constantly flying around. The next session of the day “Modern web architecture” by Ted Neward was great. Ted has his own brand of ‘edu-tainment’, and this session lived-up to his usual billing. I’m not going to spoil his punchline, but I’ll simply say that watching the recording will be well worth your time! I spent the remainder of the day in the Hackergarten, chatting to many people about OpenJDK and various JSRs (and also answering a few DevOps questions). I also managed to catch up with old friends in the hackergarten, and Anatole Tresch and I also planned our upcoming JSR-354 hackday which we ran at OpenCredo. On a final note, Devoxx UK has already been confirmed for 2015, and so please book space in your diaries for a 3 day extravaganza (yes 3 days, not 2) between 17th-20th June! I once again had the pleasure of presenting a lightning talk at the London Software Craftsmanship Community #LSCCtalks series. This time I presented a new talk I’m working on – “Crafting DevOps: Applying software craftsmanship to DevOps”. The presentation (hopefully) does what it says on the tin, in that I talk about the ideas of applying software craftsmanship principles to DevOps . If the DevOps mantra of “Infrastructure as Code” is true (which I think it is), then I believe it makes sense to learn from the craftsmanship community – in particular TDD, BDD and continuous integration. This is very much a work-in-progress talk, and I hope to develop it more over the coming weeks and months (please do send me your feedback!). Thanks again to Sandro and Samir from the LSCC for inviting me to talk, and as usual, if you have any questions, then please do get in touch. In particular please do let me know if you would like to see more on this topic. 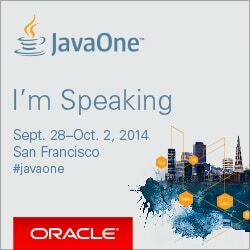 Catch me talking (four times) at JavaOne 2014! I’m very excited to be part of Oracle’s JavaOne event again this year, and I can’t wait to head over to San Francisco at the end of September! You can find details of all of the talks on my JavaOne conference profile page here. I’m speaking at JavaOne – Join me! I look forward to catching up with old friends (and making new ones) at this year’s JavaOne, and so if you are there please come and say hello! Catch me next week at Geecon, on the OpenJDK / JSR ‘Early Adopters’ Panel! Just another piece of shameless self promotion, but you can catch me at the Geecon conference in Krakow, Poland next week (May 14th-16th), where I’ll be joining Heather Vancura, Richard Warburton and Arun Gupta on a panel discussing the adoption of OpenJDK, the Java Community Process (JCP) and the Java Specification Request (JSR). You can find out more about the session and the speakers here. I look forward to seeing you at Geecon!